Roddy Phillips’ collection of columns, originally printed in the Press and Journal is a delightful record of the quirky, eccentric and downright bizarre in the day-to-day commonplace. From the shock of waking up to find a bird not only in his bedroom, but on his head, and an emergency lesson in plumbing as two toilet systems threatened to flood over the beech flooring of his steading, to seeing the ghostly and ghoulish takeover Aberdeen on Halloween, his columns offer a gentle and humorous escape from the daily grind which reminds readers to see the fun in the everyday. 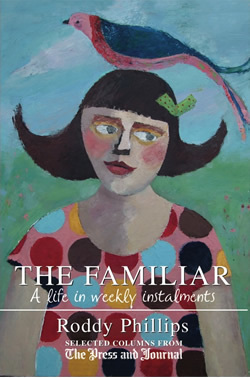 The Familiar is, in essence, a series of short stories about Phillips, his wife Catriona Millar, their children and their life in the countryside. It would be a great addition to the coffee table, fun to delve into and pick one at random for a quick pick-me-up, or read as a whole, offering a comic insight into the life of one family in the north-east of Scotland.